I love popcorn. But I also love chocolate. And because I love both as much as I do, I frequently try to combine the two. I put a handful of popcorn in my mouth, followed by shoving a handful of M&Ms in my mouth. I always end up putting entirely too much of one or the other in my mouth, and sometimes I choke a little bit. So for a long time, I’ve been trying to come up with a more efficient way to satisfy my craving. 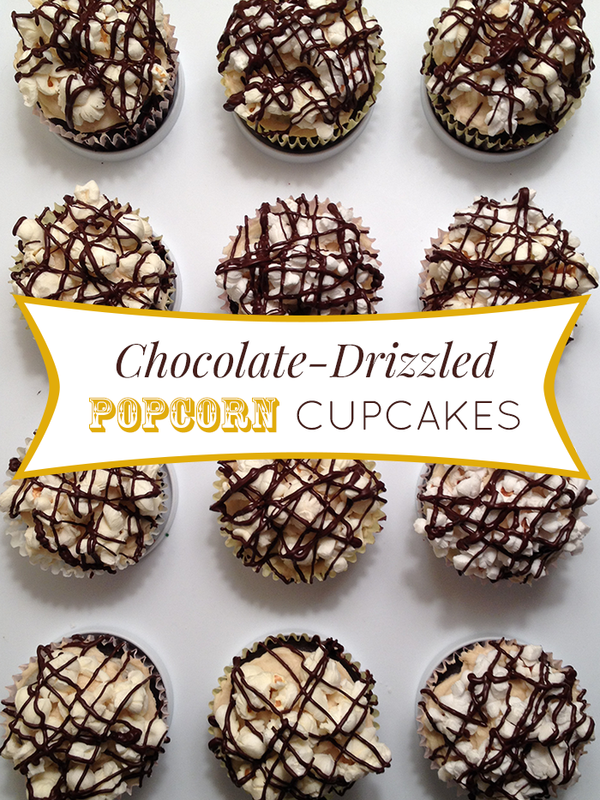 I had a dream one night and it came to me – chocolate cupcakes covered in popcorn. I was going to try to put the popcorn inside of the cupcakes, but it didn’t work out so well. As a compromise, I carefully perched them on top of a caramel buttercream frosting. Then I realized that even though the popcorn is stuck into the frosting, it still falls off when you take a bite. To solve that problem, I decided to add more chocolate. All over it. As much as I wanted. Because for me, the answer to almost anything is to add more chocolate. If you don’t want to drizzle the chocolate on top, don’t. Miss out on the added delight. Do what you want. I don’t own you. But do make sure to salt your freshly popped popcorn – I didn’t the first time around because I thought that the salt in the frosting would be enough, but it really does need that little added salt for flavor to mesh with the drizzle chocolate – you know, if you like delicious things. 1) Preheat oven to 350 degrees and prepare a muffin pan with 12 cupcake liners. 2) In a large bowl, combine flour, cocoa powder, baking powder, baking soda, salt and sugar. Whisk until well combined. 3) In a small bowl, combine milk, egg, oil and vanilla extract. Mix until just combined and then add to dry mixture. 4) Add hot coffee and beat until well combined and smooth. 5) Fill each prepared cup using a 1/3 or 1/4 measuring cup. Bake for about 15 minutes, or until a toothpick inserted into the center comes out clean. Let cool in pan for 5 minutes, then move to a cooling rack to cool completely. 6) While cupcakes are cooling, we’ll make the frosting. First you need to prepare the caramel – using a medium-sized saucepan, combine light brown sugar, heavy cream, and butter. Bring to a boil over medium-high heat, stirring constantly for 2-3 minutes. 7) Remove from heat and stir in vanilla extract and salt. Whisk until smooth and set aside. 8) In a large bowl, cream together butter and sugar. Add vanilla and salt and mix on high speed until well combined. 9) Add the caramel mixture, stirring briskly until completely combined. It should form soft peaks, but if it’s not add a little bit more powdered sugar. Set aside. 10) Using your preferred method, cook popcorn (an air popper is fast and healthy!). Salt to taste – you don’t want to douse them in salt, but you want them to have some flavor. 11) Frost cooled cupcakes as desired and top with salted popcorn to cover the surface of the frosting. 12) Pour chocolate chips into a plastic baggie and melt in microwave in 20 second intervals, kneading the bag in between. When melted, cut a tiny corner off the bag and drizzle chocolate on top of the cupcakes. Let chocolate harden, then serve. Enjoy!